I get to blog about cooking again, yay! Vegetarians, avert your eyes! One of the perks of being back near an Air Force Base is the commissary benefit. You’ve heard me talk about the awesome-awesomeness of getting to shop at commissaries, so I won’t go through all that again. Incidentally, the Offutt AFB commissary just so happens to be the nearest grocery store to our house. How cool is that? There’s a store called Baker’s nearby, but it’s just a couple more traffic lights away. I take 4-lane divided highways to the base, and an exit dumps me out about a mile from the gate nearest the commissary in 10 minutes. So I check out the selection — not the biggest commissary I’ve been to (that distinction goes to Ft. Bragg), but definitely not the smallest (NAVMAG Lualualei, where I lived from 1977-1980, wins that one). They carry local produce (sometimes) and has a sushi bar and a decent organic foods selection. I see that whole chickens are only $3-4 each, and they’re sized perfectly for our family. 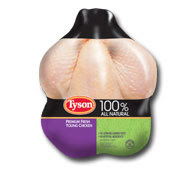 About 1/2 the price per pound compared to the Tyson “Whole Chicken Cut-up”. So I pick one up and dissect it for a couple of meals. The breasts went into chicken soft tacos, and last night I oven-fried the leg quarters. Yum. I’m left with the carcass and wings. I stuck them in the freezer over the weekend and today I started to think about making a chicken ettouffee either Friday or Saturday. My favorite recipe in the whole wide world! So I decided to break out the carcass and get it simmering on veggies for some homemade stock. I don’t do this often, I typically take the lazy route and use the Swanson’s stuff. I also delved into the blogosphere a bit to see what folks are saying about making chicken stock. Holy cow — who woulda thunk there was so much to say about it? But I was particularly interested in this posting — everything you EVER wanted to know about chicken stock. Enjoy! It’s definitely rated PG-13 for some frank discussions of chicken parts.